Writer Abroad just realized that in the next few days, she will be a living cliché. Luckily, she likes clichés. Her first cliché involves living out her Sound of Music dream as she heads to an Alpine mountaintop so remote it’s not even reachable by Swiss public transportation (What? Not reachable by Swiss public transport? Writer Abroad didn’t know such a thing was possible!). While on said mountaintop, she’ll be observing a session at the Swiss Alphorn School and interviewing its founder as well as some of his students on how one learns to play an alphorn. Then it's on to the next cliché: writing in Paris. Oui. 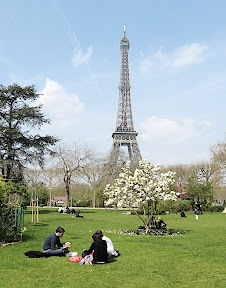 Writer Abroad is heading there for a week to participate in the Paris Writers’ Workshop. She hopes to meet some of you Paris-based writers while she’s there and to also find a coffee shop where a café au lait is less than $6. Anyone? Speaking of writing workshops, there’s also one coming up in Chicago for those of you on the other side of the world (or those of you that would prefer to be on the other side of the world). Next week, you’ll hear more about the Northwestern Summer Writers’ Conference from Zurich-based writer Kelly Jarosz, who attended the program last year. And because Writer Abroad will be très occupied while living out her clichés, next week she’s also excited to welcome a member of the Nuremberg Writers Group, Diana Santelli, to post on a topic we can probably all relate to: writer jealousy. Until next time, danke and merci to all. I couldn't be more jealous! Have a wonderful time. You will need in order to depart the actual attach as well as buggy along with motion in the gates related to a more elaborate chapel that allows you to explain your present replica gucci handbags. You might would choose in order to support the providers of the location for any elegant hotel and obtain the actual city fake panerai watches wedding ceremony that you should state your own adore along with goals. You may also have to shout from the replica prada handbags while you begin two hundred paws reduce in the motorised hoist contained in the bungee jump wrist watches support: the options tend to be numerous. Creating a tag heuer replica uk isn't really an instance obtaining solely probably none however 2 choices, neighborhood middle as well as assess home, the way in which it had been formerly. These days you'll be able to key in wedlock nearly everywhere you prefer, consequently regardless of whether you'll need the fairytale fake omega wedding ceremony or even something fairly much more uncommon, you'll be able to prefer to possess big event nearly everywhere. Fantastic content writing! I will be thus pleased an individual thought we would compose with this challenging matter nowadays. It has definitely produced my own evening. I must say I necessary the data with this matter and also you might have offered me thus. Today just click here check cashing Hazlet Thank you a whole lot!